Accra, Jan.31, GNA - Ghana is to host the 2007 Ordinary Session of the Heads and Government of the African Union (AU) Assembly in Accra as part of the activities to mark Ghana's Golden Jubilee celebrations of her Independence. The proposal presented by President John Agyekum Kufuor to the just-ended Fourth Ordinary Session and the First Mid-Term Session of the AU Assembly in Abuja, Nigeria was unanimously accepted. This was announced by Nana Addo Dankwa Akufo-Addo, Acting Foreign Minister, who accompanied President Kufuor to the Abuja Summit when briefing newsmen on arrival at the Kotoka International Airport in Accra on Monday. On the Summit, Nana Akufo-Addo said it was a record attendance, including President Hosni Mubarak of Egypt, who had not been attending the Assembly and they discussed the African agenda that include conflicts on the Continent. He said the Assembly was happy about the breakthrough in the Sudan crisis in the Darfur region, commended South African Thabo Mbeki for nthe progress in the Cote D'Ivoire crisis and the report of the High-Level Committee of the Heads of State and Government chaired by President Kufuor that dealt with the Common Defence and Non-Aggression Pact that was endorsed. The report recommended the establishment of the Stand-by Force that was central to conflict resolution on the Continent. 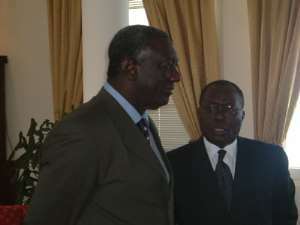 President Kufuor was met on arrival by Vice President, Aliu Mahama. AU is on top of issues on the Continent - Nana Akufo-Addo Abuja, Feb. 1, GNA - The African Union (AU) is beginning to take shape and getting on top of the African Continent's agenda, Nana Addo Dankwa Akufo-Addo, Acting Minister of Foreign Affairs said in Abuja, Nigeria on Monday. He said the confidence and the manner in which the AU was approaching its work had given hope to the Continent that "a working Union is now taking place on the Continent". Nana Akufo-Addo was speaking to newsmen at the end of the just-ended two-day Fourth Ordinary Session and the First Mid-Term Session of the Assembly of the Heads of State and Government of the African Union (AU) held in Abuja. He said among the decisions taken at the Summit was for the Union to study the report of the High Level Panel on Threats, Challenges and Change relating to the reform of the United Nations (UN). Nana Akufo-Addo said a committee, which was expected to meet in Swaziland had been set up to study the report for the leaders' firm decision on the reforms. He said the Summit also adopted the report by the High-Level Committee on the Common Defence and Non-Aggression Pact that proposed the establishment of the African Stand-by Force.